It's time for another bookish tag: 10 Books That Have Stayed with Me. Thanks so much to Charlene at Bookish Whimsy and Alisa at Picture Us Reading for tagging me! My copy of this has seen better days, but then it's about 25 years old and has been read many, many times. I don't have a lot of books from my childhood, but this is one that I've never been able to part with and probably never will. This was one of the first books I truly felt a connection to as a young reader, with one of the characters being Asian and adopted, like me. I also completely related to the book's story of growing up and growing apart from the best friend you thought you'd have forever. This book will always have a special place in my heart. I started reading Poe's short stories when I was about 12. They marked a big step away from the Sweet Valley Twins books I'd been obsessed with but had grown out of by this time, lol. I loved how creepy and macabre Poe's stories were, which is pretty ironic because in general, I don't like scary stories or movies. I'd read Romeo and Juliet as a high school sophomore and Macbeth as a junior, but it wasn't until I read Hamlet the summer before senior year that I began to think, hey, this Shakespeare dude is pretty good! I don't know—maybe it was all of the stark raving crazy in it that clicked with me, but for whatever reason, Hamlet's the thing that really made me love Shakespeare. My favorite adaptation stars a guy you may have heard of: David Tennant. This is my most favoritest novel ever. EVER!!!! As much as I love Pride and Prejudice and Lizzy and Darcy, Anne and Wentworth are THE literary couple for me. It's hard not to root for shy, timid Anne who's rather unloved by her snooty, vain family. I distinctly remember reading a certain part of the novel that just blew me away with the sheer beauty of its prose and is in my opinion, Austen's finest moment as an author. I don't know where to start with why I love this series. I mean, it's Harry Potter, lol. 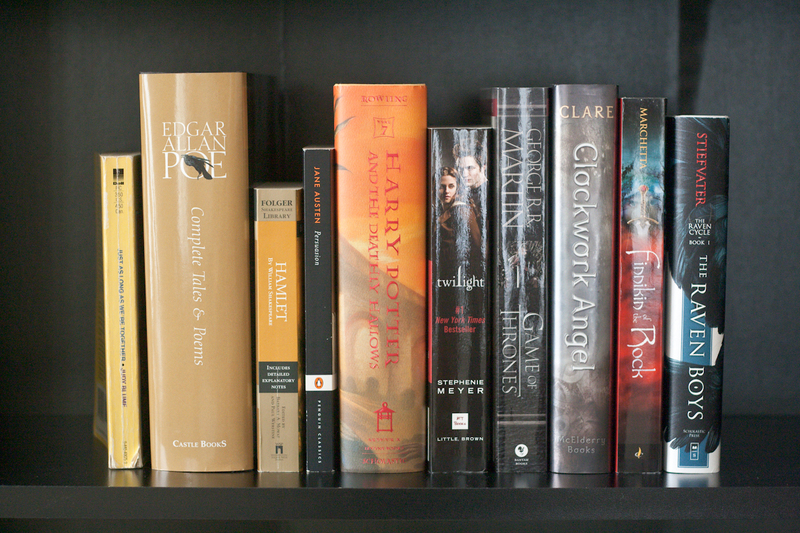 I was already in my 20's when I began reading the books, but they just transcend age. I wish I could go to Hogwarts. I wish I could be a member of Dunbledore's Army. So basically what I'm saying is: I wish I were Hermione Granger. As much as my reading tastes have changed since I first read this back in 2008, I had to include it. I cannot emphasize enough how reading this book marked a huge turning point in my life. Twilight reignited my love for reading, and if I hadn't picked up that book, I might never have started reading again after taking a long hiatus from it after college. Another life-changing read. About a month before the show premiered, Ally and I were looking for a book to buddy read, and it was a toss-up between this and another epic fantasy. Copies of A Game of Thrones, complete with TV series tie-in cover, were popping up everywhere, so since it was so readily available, we went with it. Good choice, I think. It's also thanks to this series that I discovered Goodreads. I was on an ASoIaF fan board looking for book recommendations, and posters kept mentioning this site called Goodreads. I signed up immediately! Victorian Shadowhunters! This series for me is the perfect combination of paranormal, fantasy, angel mythology, and a Victorian London setting. It's the realization of my wishlist of elements that I love in books, not to mention that I just LOVE the three main characters. There's just a love-fest between this series and me, and I sobbed when it ended. Truly a masterpiece of YA high fantasy by Marchetta, who's a brilliant author no matter what genre she writes. This series sent me on a mission to seek out other amazing YA fantasy titles after I'd been locked in a paranormal reading frame of mind for so long. Both The Raven Boys and The Dream Thieves gave me severe book hangovers. In fact, I'm probably still recovering from The Dream Thieves. I'm struggling to describe why I connected with this series on such a profound level, other than I did. It's the series that I mercilessly push to other readers. It's the series that I fangirl incessantly about. It's the series that Ally, Melissa, and I could talk about for forever with each other. We read The Dream Thieves together, as a family, and texted/emailed each other our reactions. We're gearing up to do it all again next month for Blue Lily, Lily Blue. I have to agree about really liking Hamlet, it was definitely one Shakespeare play I connected with and actually made the effort to read it all and was not bored! I have not really read that many other Shakespeare books, but that is one that makes me really like him! I really like your list, although I do have to get around to reading some Maggie Stiefvater soon since I have only read one of her books and everyone raves so much! I tried reading a few of Shakespeare's comedies some years ago, but they just didn't grab my attention like the tragedies, especially Hamlet. I adore Maggie Stiefvater's storytelling; she's an absolute genius, and her writing is SO beautiful! YES- you MUST see David Tennant as Hamlet! ❤ He's amazing in any role, but his Hamlet is PHENOMENAL. Patrick Stewart plays Claudius, and their scenes together are simply brilliant. As for Poe, I loved how creeptastic his tales were, and some of them are quite scary, but that never translated into me loving horror books or movies, lol. This is a fantastic list! Some of your book choices meant a lot to me too (I LOL'd at your comment that Poe was a huge transition from Sweet Valley High - so true!) And I love that your favorite Hamlet is David Tennant - he was so awesome in that role! And I'm almost to my Persuasion read - the last Austen novel I have to read - and I'm really looking forward to seeing why people love it so much!